U2 has been one of the most popular rock bands in the world since the 1980s. According to the RIAA, they have sold approximately 50.5 million albums in the U.S., had six #1 albums in the U.S. and are widely considered as one of the most successful groups of the last 25 years. The band is also very politically active in human rights causes, such as the Make Poverty History campaign as well as the spearheaded campaign by Bono, DATA (Debt, AIDS, Trade in Africa). U2 are an Irish rock band featuring Bono (Paul David Hewson) on vocals and guitar, The Edge (David Howell Evans) on guitar and pianos and vocals, Adam Clayton on bass, and Larry Mullen Jr. on drums and vocals. 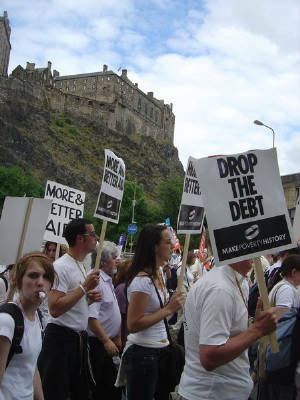 The Make Poverty History campaign is a British and Irish coalition of charities, religious groups, trade unions, campaigning groups and celebrities who are mobilizing around the UK's prominence in world politics in 2005 to increase awareness and pressure governments into taking actions towards relieving absolute poverty. The symbol of the campaign is a white wristband made of cotton or silicone. A 'virtual' white band is also available to be displayed on websites. TV ads have also been running for many months, urging people to speak to their representatives about stopping poverty. However, OFCOM banned the ads, deciding that the ads were "wholly or mainly political" in nature, since they aimed to "achieve important changes". The campaign has said it was "dissapointed" in the decision. It should be noted that none of these aims are new (there have been many attempts over the last few decades to promote them), but the scale of the 2005 campaign dwarfs previous efforts.